Our forums are slowly starting to appreciate everything British ELLE lately, just as the magazine’s brand new EIC, Anne-Marie Curtis, begins to take over the magazine. Lana Del Rey photographed like a dream for the June cover, while Hailey Baldwin stunned on last month’s offering. 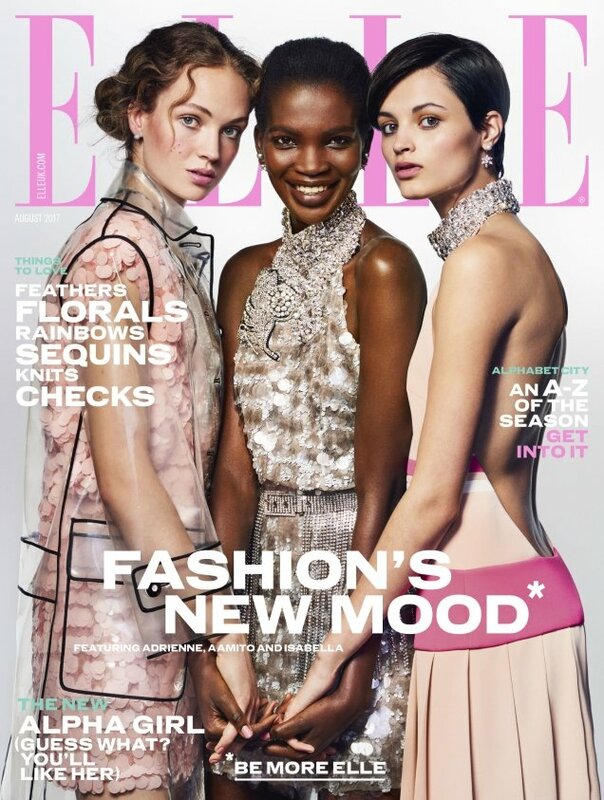 As the fall season looms, UK ELLE ushers in “fashion’s new mood” with the August issue and welcomes cover girls Adrienne Juliger, Aamito Lagum and Isabella Emmack wearing head-to-toe Miu Miu, captured by Liz Collins. One model, in particular, stood out from the trio. “Aamito (center) could’ve handled this cover alone. She is just so stunning!” said mathiaskatz. “This definitely should be a solo cover for Aamito, anyway I’m glad she got it!” agreed thatsfierce. “Aamito looks stunning and actually like a professional model. The other two just like they’re being forced to pose,” forum member pearlsandtwirls agreed. “Has the feel of a filler month. Should have gone all the way and given us Aamito,” tigerrouge chimed in. “Only Aamito is giving me anything on these covers. Such a shame they weren’t confident to go with just her,” stated 333101. “Why is Aamito the only one smiling? Lol. Still, I like it! Baby steps. We’ve always wanted models on covers and now we’re getting them. ELLE and Harper’s should be applauded. The styling reminds me of Cara, Georgia and Suki on British Vogue. Way too festive for August,” stated Benn98. Check out the other cover for this issue and share your opinion with us here. A Bevy of Diverse Models Star on UK Harper’s Bazaar’s ‘Garish’ August CoversHow Did Vogue Japan Manage to Make Six Top Models Look So Plastic on This September Cover?